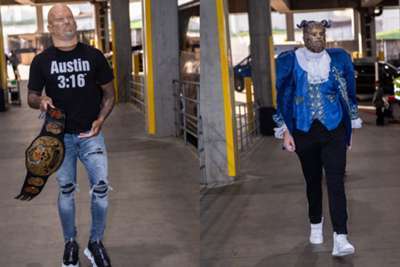 Halloween came early for the Portland Trail Blazers on Monday as players turned up for their NBA clash with the Washington Wizards in fancy dress. From Gary Trent Jr's kangaroo to Damian Lillard's 'Stone Cold' Steve Austin, the full range of costumes included a penguin, the Beast (of Beauty and the Beast fame) and Freddy Krueger. The pre-match fun could not inspire the Trail Blazers to victory, however, as the Wizards came away with a 125-124 victory. That defeat was the Trail Blazers' first of the season.